The summer is officially over and that means a new have fun & learn season is back for Teddy. This fall Teddy started learning to skate. Teddy joined Kidz ‘N’ You program in “The Sports Village”. 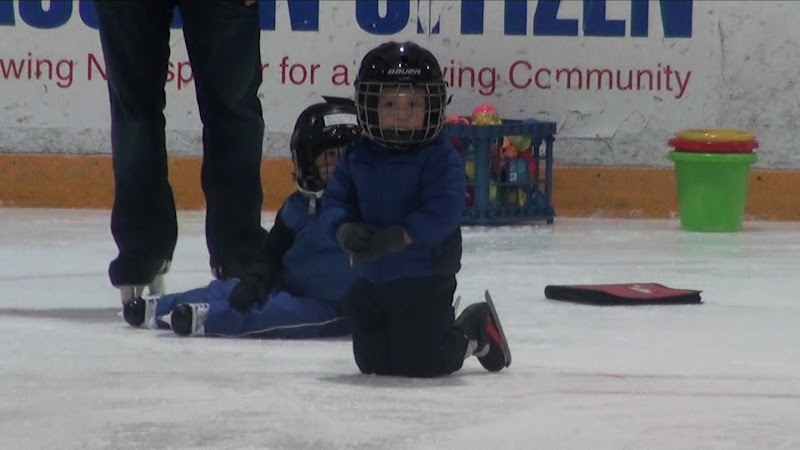 Kidz ‘N’ You is an instructional skating class for 2.5-5 years old designed to introduce first time skaters to the ice. Teddy already took first two lessons and likes it very much. We didn’t forget about our old friend – 4Cats Art Studio. Teddy joined Mixed Media program there that includes variety of art techniques and mediums: papier-mâché, sculpting clay, using pottery wheel, painting on unstretched canvas, silk screening. The fist lesson was amazing – we painted canvas for a little bee painting and made a body of owl/penguin to be from papier-mâché. One morning after the art class we discussed with Teddy, what he wants to make and he was eager to create an owl. When we got to a daycare, he was very frustrated and a drop of tear appeared under his eye. He thought we were going to the art studio! We realized how he cares and is passionate about it. This is a good sign. New Year; when he turns 3 years old (end of February); or later. The exiting new season ahead and we will post updates on Teddy’s discoveries and accomplishments in the future. Love the skating pic! I remember those days! My guys second year of hockey starts Monday, can't wait!